I have adored this stamp by Penny Black for years...which is about how long it took me to finally ink it up and color it! My son is quite the gamer and though his age has surpassed this gamer, I still found it fitting for his birthday card! I colored the image with Prismacolor pencils and shaded with Gamsol. My papers are from the retired Stargazer Collection by Close To My Heart. 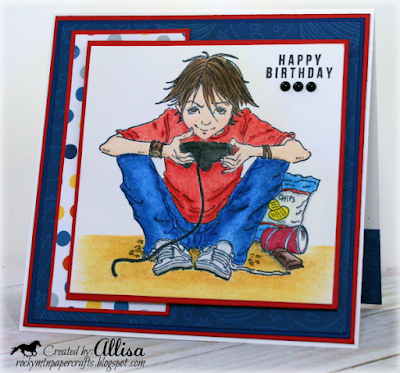 I'm sure your son will love this clever card, Allisa! It is such a perfect image of a gamer with it's bright, happy colours! Great use of background papers! Great masculine card! Thanks for playing along at Seize The Birthday.